Managing the decline of coal dependent cities will be a tricky balancing act for the government. Most of these 19 cities primarily mined coal, but with the sector in decline, an urgent search is on for new economic opportunities. Many of the problems faced by the northeast reflect the broader need for China to shift to more sustainable economic development as environmental pressures force it to restore the environment and reduce carbon emissions in the context of a drive to promote renewable energy. It is getting harder to mine coal in China’s northeast. Most seams have been mined too extensively, with some pits descending over a kilometre down into the earth. At those depths, the temperature and humidity become problematic for large machinery so more labour intensive methods are used. But higher labour costs mean that the cost of coal mining has rocketed to unsustainable levels. 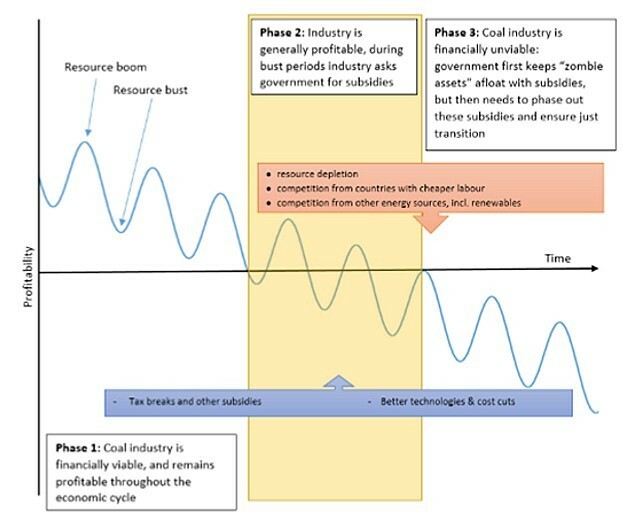 According to a recent report, jointly published by the Chinese Academy of Social Sciences’ Institute of Urban and Environmental Studies and the Research Institute for Global Value Chains at the University of International Business and Economics, coal companies nationwide employ on average 11 people per 10,000 tonnes of coal output. However, industry leaders such as Shenhua and the China National Coal Group have reduced this to 4-5 people. In contrast, older northeast companies such as the Jilin Coal Group and Shenyang Coal Group employ around 21, and the Heilongjiang Coal Group employs 48 – more than four times the national average. The additional labour increases costs. The Heilongjiang Coal Group pays 451 yuan to extract one tonne of coal, with labour costs accounting for 215 yuan. This compares to less than 200 yuan for one tonne of coal for Shenhua. The government has also put pressure on the coal sector in the northeast through policies to reduce coal power generation and steel output, aimed at improving air quality. In 2016, China reduced coal consumption for the third consecutive year, leading many to believe that the country’s coal consumption had already peaked. In 2016, the industry was instructed to reduce coal output by about 500 million tonnes over the next three to five years from the current level of 3.8 billion tonnes per year as China sought to become a world leader in solar and wind power. The report estimates that by 2020 the coal sector will employ less than three million people, down from 5.29 million in 2013. This means that within seven years approximately 2.3 million miners will require reemployment. Already during coal’s golden decade between 2004 and 2013, efficiency improvements reduced the need for labour. Between 2000 and 2012 the average number of employees per 10,000 tonnes of coal produced was reduced by more than half, from 29 to 14. Even without resource depletion and reductions in output, coal jobs in the northeast would have gradually been lost. Gao Jinxue, party secretary of the Hengda Mining Group in Liaoning province told Xinhua that labor cost accounts for 45% of the company’s total cost. “It is not affordable”, said Gao. “This means we have to lay off some workers”. As far as the differences between state-owned enterprises and private enterprises, some hold the view that the state continues to “protect its own children”. According to China’s State Administration of Work Safety, 14 large coal bases account for 92.3% of the country’s total output. 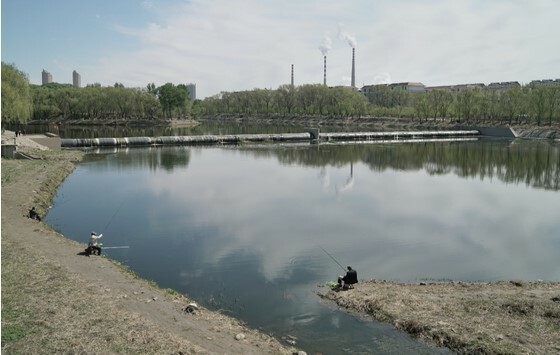 The construction of these large coal bases was put forward by the State Council in 2014. There are 102 mining areas, mainly owned by large state-owned coal enterprises and local state-owned enterprises. Yet, in proportion to their volume and output, SOEs’ commitment to cut excess capacity appears to be low. For example, China’s 14 central enterprises’ original design capacity is 846 million tons, which should be reduced by 135 million tons. However, the target set by SASAC was only 31 million tons. In short, large state-owned mines will continue to dominate coal even as the sector shrinks. Former miners find it hard to find new jobs. Jiang Zhimin, deputy head of the China Coal Industry Association, said at the start of this year that in 2016 posts had been found for some by letting temporary workers go and moving others to new work. But as reduction in output continues, the coal industry is less able to find an alternative to making miners redundant. With half of all miners over 45 years old and six out of ten educated to junior middle school level or less, finding new work is particularly challenging. China’s large state-owned enterprises (SOE) are regarded as an extension of government, and a major SOE may have its own hospitals, schools, retirement homes and post office – it is a major part of life not just of its employees but for their children, too. The large state-owned coal mines of the north-east are a classic example of this. “Only SOE or government jobs are regarded as real work,” says Wang Miao, an assistant researcher with the Research Institute for Global Value Chains. 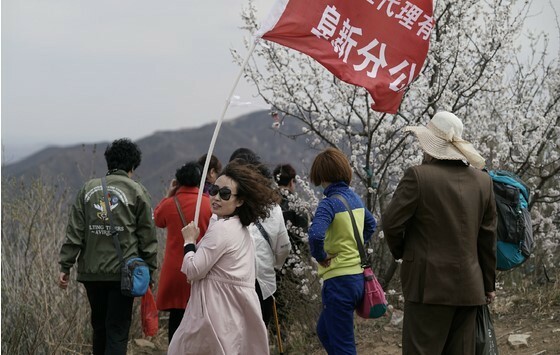 She has found that some miners prefer to stay in mines facing imminent closure, earning just 800 yuan a month, rather than try to find more lucrative work elsewhere. Some miners, despite being forced to look for new jobs, keep their shovels and other mining implements at home, in the hope that one day they can return to mining. Wang Miao explained that the hope the industry will one day recover keeps many from leaving the sector altogether. According to a report from the International Institute for Sustainable Development (IISD) there are countless global examples showing how reduced employment due to macro-level industrial policies can have profound social impacts – especially in subsidised industries. The dilemma for government to deal with the coal mining cities is that if changes are not made then the financial costs and environmental risks can be enormous, but if changes are rapid and drastic, a range of social problems may arise. And once a transition is underway, it cannot be reversed. In this, China’s policy makers appear to have accepted that a transition is inevitable, unlike in the US where the Trump administration is looking to revive the flagging coal sector while ignoring environmental concerns. There appears to be little hope for a revival of the coal industry, which must contest with China’s changing economic structure, the rise of service industries, and the development of new energy sources, says Huo Jingdong, deputy head of the Beijing Municipal Institute for Economic and Social Development. In the short term, SOEs can be subsidised while they operate at a loss and reduce costs by cutting working hours and salaries, says Richard Bridle, senior policy advisor at IISD. But such fixes are not long-term solutions. Cutting workers is the only option, argues Bridle, but it must go hand in hand with an effort to create new employment opportunities elsewhere so that miners can be reemployed. Fuxin, a coal city in Liaoning, is developing wind power generation and manufacturing. In 2016, the city had 1.89 gigawatts of installed wind power, accounting for 30% of the province’s total wind power generation. Fuxin now gets half of its power from the wind. Commenting on this, Zhang Ying, an assistant researcher with the Institute of Urban and Environmental Studies, said that such efforts to replace jobs in mining cities are just getting underway and there are significant uncertainties over future funding and market prospects. Also, most of the replacement industries are in technology or capital intensive sectors so they won’t provide as many jobs as the labour intensive coal sector. There appear to be few good examples to emulate internationally. The IISD notes in its report that Asturias in Spain offered early retirement to miners facing similar issues. This resolved short and medium term issuesm but meant there was little impetus for long term development. Up on the hill you can hear the new turbines spinning in the strong breeze. Chen Fang, from the village of Taizigou, hopes the wind will bring rain so she can plant her seeds. 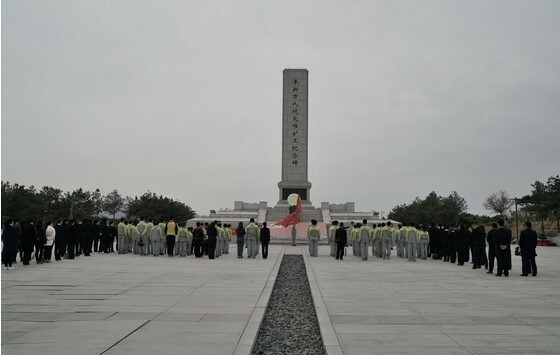 The Fuxin Haizhou Open-cast Mine, allegedly Asia’s largest open cast mine, was once the pride of the people of Fuxin. Despite being closed for many years, small fires can still be seen along in the 6-kilometre pit, spontaneously igniting in the coal layer. On December 28, 2001, Fuxin was officially designated as a resource-drained city by the State Council – the first such city. Locals and tourists come in a steady stream to visit a memorial to coal miners who died in the mines between 1914 and 1946. 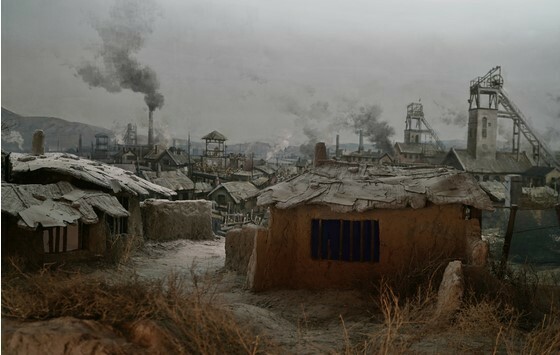 Fuxin was founded and flourished on the coal economy, and was one of the first centres of energy production set up by the People’s Republic of China. A model of the old mining area in the mining museum. In over half a century, 530 million tonnes of coal were extracted in Fuxin – loaded into 60-tonne trucks that cumulatively would circle the globe 4.3 times. In the old mining villages near the pits you can still find some former miners living there. Huang Anyuan is one of them. He worked in the mines for 30 years before retiring. Five years ago the government offered him new accommodation available to those affected by subsidence but he gave this to his son while he and his wife stayed put. Most of the buildings nearby were demolished last year. The water’s been cut-off so people have to fetch it themselves. A pile of rubble now stands on the site of the old dormitory buildings. Like Huang Anyuan, many former residents have chosen to give their allocated new homes to their children, while they rent tiny rooms elsewhere. As former mining villages have been demolished, one collector has been gathering old millstones. In the 1980s and 90s depletion of coal seams and increasing extraction costs meant that the city’s coal-led economy started to fail – and with it the city. The Fuxin Mining Group closed 23 mines and laid off 129,000 workers, 28.8% of all its employees. 198,000 residents of the city, a quarter of the total, receive welfare payments designed to ensure a minimum standard of living. In the areas populated by former miners there are many middle aged people with little to do. In some Fuxin households, a miner’s pension may be the only income for three generations. As the coal industry collapsed, finding new jobs for those laid off became more urgent. But finding work for so many manual workers in such a short time and when there were no major employers or industries available was impossible. Some have opened small shops or other small businesses to earn spending money. 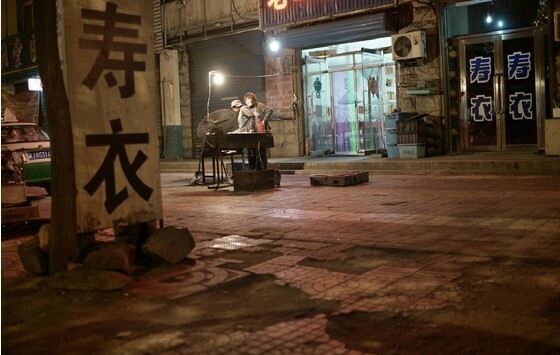 There are lots of barbecue stalls on the streets of Fuxin, more than other north-eastern cities. The locals say it’s partly because they love barbecue in the north-east, but also because this is the cheapest way to set yourself up in business after being laid off. On a sunny weekend both banks of this river would be lined with middle-aged fishermen. Former city Party secretary Wang Qiong summarised the city’s economic transition plan as one of self-reliance supported by strong market and technology-led private firms. If you want a seat on the train between Fuxin and Shenyang you need to book two days in advance. The city is finally recovering after 15 years of transition, and people are starting to come back. 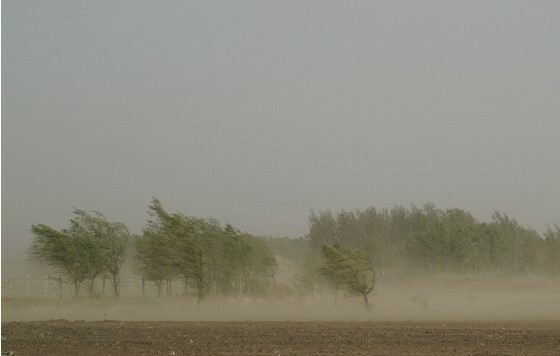 Here in the transition zone between the Mongolian plateau and the plains west of the Liao river, the trees in the villages around Fuxin bend in the wind. Over the past 15 years it is that wind that has provided the city with an alternative to coal energy. The wind turbines offer a new view from the top of Tashan. By 2015 the city had 3.6 gigawatts of wind power capacity installed. The city’s leaders are keen for the sector to replace coal. Fuxin has transitioned to an era of wind power. By the end of 2016 the city was supplying 1.89 gigawatts to the grid – 30% of Liaoning’s wind power generation. In a new village built for coal miners in the Fuxin district of Xinqiu, Gao Yuan sells silk scarves. She is also waiting for the wind having tied a line between two trees and hung her scarves from it. The one yuan scarves flutter more in the wind, which is good for sales. 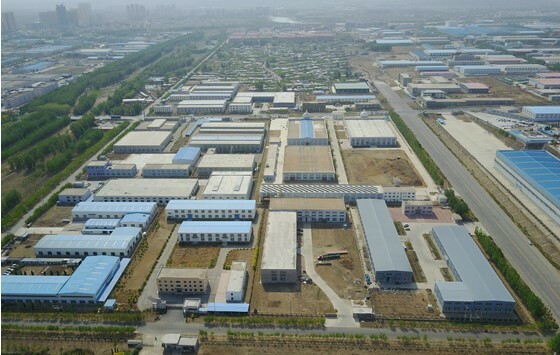 Fuxin has built a new industrial zone to the west. As of the end of 2015, Fuxin’s wind power manufacturers were producing output worth 20.1 billion yuan – 8.5 billion yuan in turbines, 9 billion in components, 1.5 billion in services, and 1.1 billion in materials. The new energy sector has created over 5,500 jobs in Fuxin. 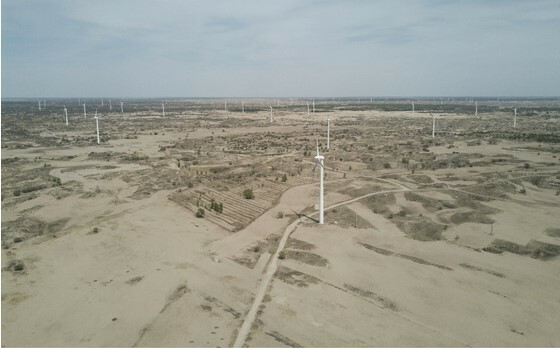 One single wind power firm, Huaneng, pays almost 200 million yuan in taxes in the city – and this is while still entitled to tax reductions. 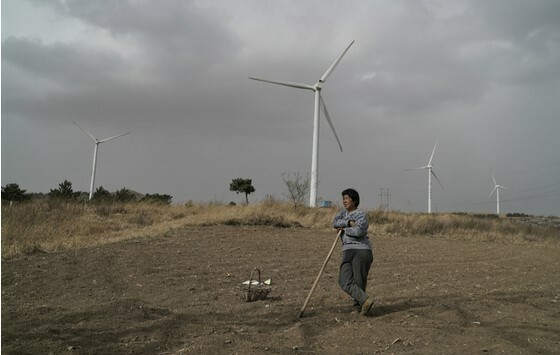 At 7’o’clock in the morning in Tazigou, a village in northeast China, the sky is dark, the wind strong, and you can hear the new turbines up on the hill spinning. “With this wind…”, Chen Fang forecasts a rainstorm, picks up her hoe and corn seeds and heads up the hillside from her home. 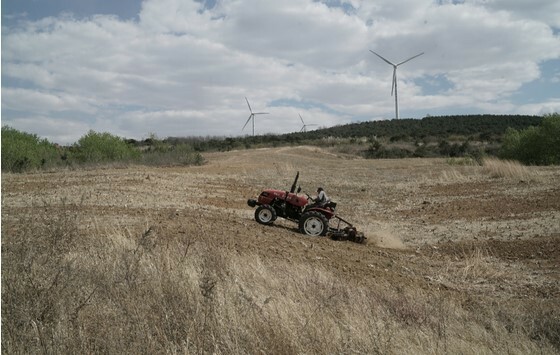 By 5’o’clock that afternoon she’s turned the earth and cleared rocks on her family’s one mu (670 square metres) of land underneath the turbines. The clouds have dispersed and the four turbines have stopped turning. “Waited for nothing!” she sighs, muttering to herself. This is the fourth time this month she’s come up here, hoping the wind will bring rain so she can plant the spring corn. The wind comes and goes but the rain never falls. She’s starting to get anxious. This hill, known as Tashan, lies to the southeast of Fuxin town in Liaoning province, about 5 kilometres from the city. Since March, when the snow melted, to now in early May there hasn’t been a single decent rain storm here on the transition zone between the Inner Mongolian plateau and the Liaohe plains (a farming area in Manchuria in northeast China). Rain is precious in these parts, particularly for fields like this that have no irrigation. And it’s not just farmer Chen Fang who is waiting for wind. Once Asia’s largest open-cast mine, the Fuxin Haizhou mine closed many years ago. But small fires can still be seen spontaneously igniting in the coal layer in pits for 6 kilometres. With no wind, the smoke and ash hang in the air and have become the main cause of complaint for residents in nearby Fuxin. 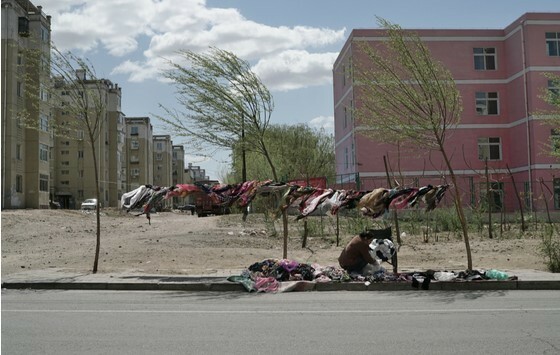 In a new village, built for coal miners in the Fuxin district of Xinqiu, Gao Yuan, a silk scarf seller, is also waiting for the wind – she’s tied a line between two trees to hang her wares from it. The windier it is the more the 1 yuan (US$0.15) scarves flutter and the more she sells. From Tashan in Fuxin to the vast new windfarms in Inner Mongolia’s Hure Banner, everyone’s waiting for the wind. Over the last fifty years Fuxin has provided the nation with 700 million tonnes of coal and 250 billion kilowatt hours of electricity. But the city, which was founded and flourished on the profits of coal power, is struggling as the coal runs out and is in dire need of an alternative source of growth. On December 28, 2001, Fuxin was officially designated as a resource-exhausted city by the State Council – the first city to have been designated so. “Fuxin was founded because of coal, it flourished because of coal; it was one of the first centres of energy production set up by the People’s Republic of China. To develop the nation we tried to be number one, to mine more coal. 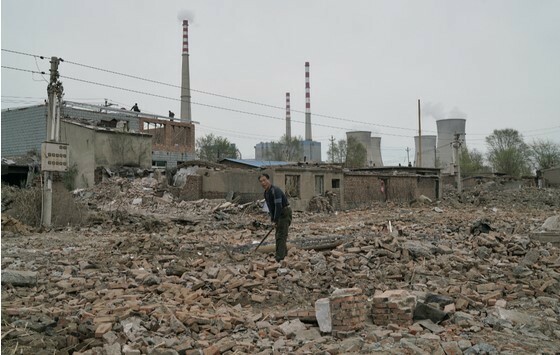 Now, we’re the first resource-drained city.” Yang Zhonglin worked in Fuxin for 13 years between 2003 and 2016 and has been the city’s deputy Party secretary and Mayor. He has seen the city through its toughest decade. Fuxin is a classic example of China’s mining cities. In the 1980s and 1990s depletion of coal seams and increasing costs meant that the city’s coal-led economy started to fail – and the city’s prosperity went down with it. As the open-cast mine became stripped bare, so the miners dug their pits, deeper and deeper. 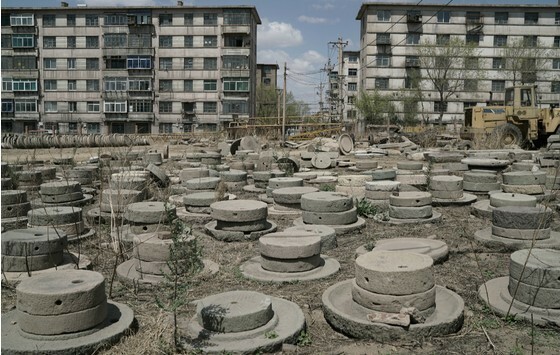 Subsidence affects 101 square kilometres of land in Fuxin, where the miners’ huts only occupy 5 square kilometres. In 2000 over one third of local industrial firms were either closed or operating at half-capacity. The Fuxin Mining Group closed 23 mines and laid off 129,000 workers, 28.8% of its employees. A quarter of the city’s residents, 198,000 people, were on welfare payments available to ensure a minimum standard of living was met. 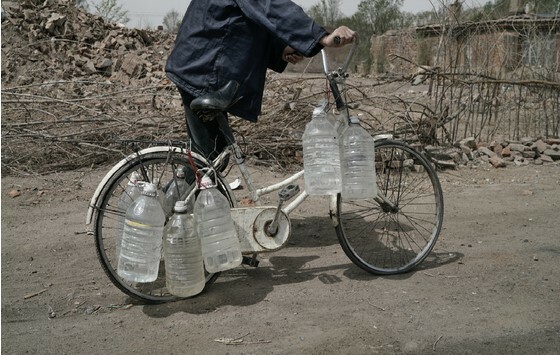 Subsidence is a common problem in mining areas and Xinqiu is one of the worst affected areas. Local media referred to two particularly shocking cases; in 1999, a vehicle travelling on a road in the south of the district, near Pit 8, was swallowed by a sink hole, disappearing as if by magic; and in 2000 a child named Huang Kai met a similar fate, falling “like a stone” into a disused mine when a sinkhole opened up beneath him. 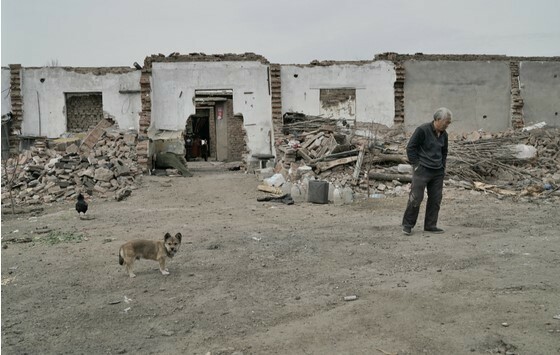 Subsidence has caused Fuxin direct and indirect losses estimated at 1.5 billion yuan (US$223 million) but its also a daily hazard for residents who complain of entire buildings sinking without warning. Walk into any as-yet undemolished buildings in an old mining dormitory complex and you can see the cracks in the walls. You can hear the wind howl through. When Fuxin was designated as a resource-drained city, the economic commission’s transition office calculated that 28,000 homes had been damaged by subsidence to some degree across thirteen different affected areas. Fuxin’s open-cast mine, supposedly Asia’s largest, is 4-kilometres long, 2-kilometresacross, and 350-metres deep. Send a drone 500-metres up and look down with a 120 degree lens and you can still only see a third of it. It’s a huge and spectacular sight, and once a source of great pride for Fuxin. Over more than half a century, 530 million tonnes of coal were mined in Fuxin; loaded into 60-tonne trucks that travelled a distance equivalent to circling the globe 4.3 times. The Haizhou mine alone employed over 30,000 workers at its peak. But those glories are passed now and what was once a source of pride has become a scar. On March 30, 2001, the Dongliang and Ping’an mines, and the Xinqiu opencast mine, were shut down with State Council approval. 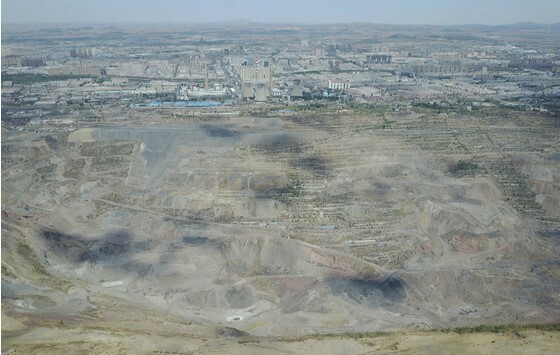 In April 2002 the Haizhou opencast mine, Asia’s largest, applied for bankruptcy due to depletion. In June 2002 several other mines, run by the Fuxin Mining Bureau, also applied for bankruptcy. Figures show that between 1996 and 2000 the city’s GDP grew by only 2.1% a year, 6.2 percentage points below the national average. Fuxin was also entirely reliant on one sector; with coal power accounting for 76% of its economy. 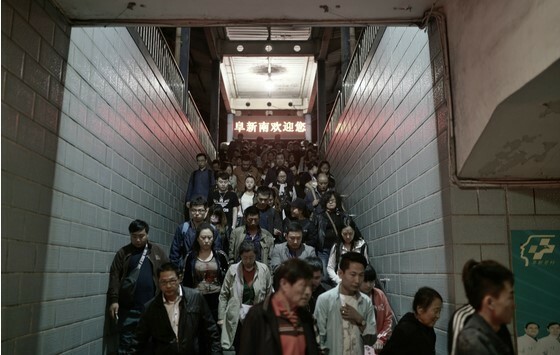 By the end of 2000, 25.3% of the city’s population had a monthly income below the minimum level set for living standards welfare (156 yuan, or US$23). An estimated 156,000 residents, 36.7% of the total, were out of work, and unemployed rates were higher than any other city in Liaoning province. As the coal industry collapsed, finding new jobs for those laid off became more urgent. But to find work for so many manual workers in such a short space of time, when there were no major employers or industries available, was virtually impossible. 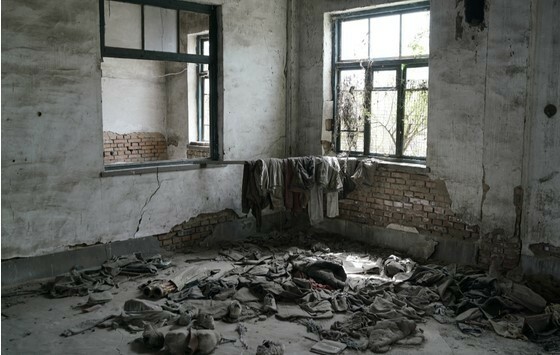 In the old mining villages near the pits you can still find some former miners – Huang Anyuan is one of them. 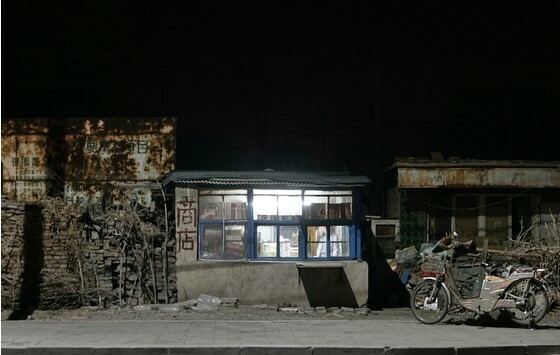 He worked in the mines for 30 years and has now retired on a pension of 2,000 yuan (US$300) a month. He and his wife continue to live in their two oft-repaired rooms. Most of the buildings nearby were demolished last year, and now that the water’s been cut off each day they must walk to fetch supplies. Many others have also given the homes they’ve been allocated to their children. 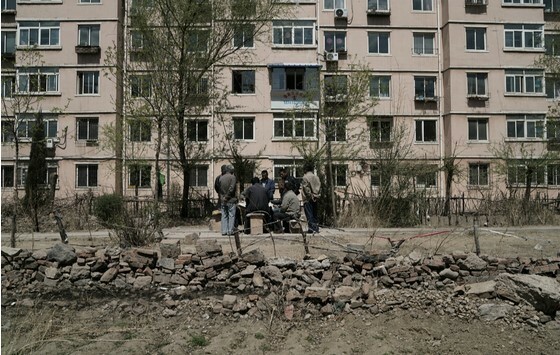 As their original homes have been demolished they are forced to rent tiny rooms elsewhere. In some households a miner’s pension is the main income supporting three generations. Some former miners are in poor health and need to be cared for by their children. This means the young can’t travel to find work. As there aren’t suitable jobs close to home, they find themselves both caring for the elderly and living off them. There are lots of barbecue stalls on the streets of Fuxin, more than in other northeastern cities, some reckon. A quick count in certain districts found up to 21 stalls or barbecue restaurants on a 500 metre street, and never less than five. In the evening even more appear, rolled out on the back of three-wheel carts. The locals say it’s partly because of the love of barbecue in the northeast, but also because this is the cheapest way to set yourself up in business after being laid off. Mr. Zhang (who prefers not to use his real name because of the sensitivity surrounding this issue) worked down in the mines for thirty years – now he works on top of a hill. In the hills to the east of Fuxin, rows of turbine blades whirr round. Looking back towards the city from below the turbines you see the vast Haizhou opencast mine, a reminder of the city’s past. Construction of the wind farm started in 2007, one of the first in Fuxin. Covering about 20 square kilometres, there are 67 turbines along the ridge, generating 100 megawatts of power. Mr Zhang is one of 20 employees, but he is only a temporary employee. Those (with permanent contracts) who run and maintain the turbines are all engineers with technical skills. Those engineering jobs have been created by the wind power sector, and represent a change that has come to Fuxin with the new century – the arrival of wind power. By the end of 2016 the city was supplying 1.89 gigawatts to the grid, 30% of Liaoning’s total wind power generation. The city’s leaders are keen to make use of this sector to replace coal, both as a source of energy and as an economic driver. According to the China Energy News the new energy sector has created over 5,500 jobs in Fuxin. One single wind power firm, Huaneng, pays almost 200 million yuan (US$30 million) in taxes in the city – and this is while still entitled to tax reductions. And it isn’t just the power companies that are here, turbine manufacturers have also found a home in Fuxin. As wind power has expanded, Dajin Heavy Industries has become one of the leading manufacturers of turbines, and one of the three such firms with a market listing. It has factories around the country and employs over 500 people in Fuxin alone. Dajin originally made equipment for the coal power industry. In 2008 it set records when it built the steel structure for a 670 megawatt furnace for the Huaneng Group – the biggest, heaviest and most complex such structure ever built in China. It now builds the towers for turbines, and has recently added four more production lines. As of the end of 2015, Fuxin’s wind power manufacturers were producing output worth 20 billion yuan (US$3 billion) — 8.5 billion yuan (US$1.3 billion) of turbines, 9 billion yuan (US$1.3 billion) of components, 1.5 billion yuan of services, and 1.1 billion yuan (US$223 million) of materials. One insider in the city’s wind power manufacturing sector said that the only technically demanding part of the process is the welding, and that most miners could do this work after some simple training. “Looking back over the last 15 years, we’ve made the right choices,” said Chen Zhihong, head of the city’s Development and Reform Commission in an interview with the Xinhua Daily Telegraph, adding that although these companies are small they are still growing. He thinks these companies need the resources that Fuxin has, and that there are good prospects for future growth. He offered some data on the city’s economic transition. Compared with 2001, average disposable income in the city has gone from 4,300 yuan (US$ 630) to over 22,000 yuan (US$ 3,274). The percentage of total income derived from the coal sector has dropped from 49.8% to 16.9%, whereas for manufacturing it has risen from 4.8% to 23%, according to Chen. “The biggest success is that we’ve brought people out of a slump, we’ve given them hope for growth,” Chen said. In 2016, as coal mining output declined the need to find new jobs surged. Will the emerging wind power sector be able to offer enough reemployment opportunities? Running a wind farm isn’t labour intensive. And with slowing demand for electricity across China, could turbine manufacturing, which is heavily reliant on expansion of wind power, be able to keep growing? These aren’t just questions for Fuxin but for all China. 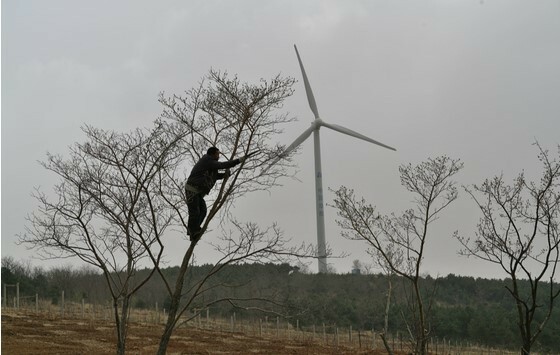 On May 7, as we left Fuxin, the wind was blowing again and the turbines spinning. And at 4’o’clock in the afternoon, the rain finally came. Only a light rain, but we hoped Chen Fang would, after a month of waiting below the turbines, be able to plant her corn.